Juan Williams: My Words Were 'Not A Bigoted Statement' : The Two-Way The news analyst said on Fox News Channel's O'Reilly Factor that when he's on a plane, people in "Muslim garb" make him nervous. NPR says the comments "were inconsistent with our editorial standards and practices." Update at 8:30 p.m. ET. There's a fresh post here headlined "Juan Williams: NPR Went After Me Because 'I Appear On Fox'." "Used an honest statement of feeling as the basis for a charge of bigotry to create a basis for firing me. Well, now that I no longer work for NPR let me give you my opinion. This is an outrageous violation of journalistic standards and ethics by management that has no use for a diversity of opinion, ideas or a diversity of staff (I was the only black male on the air). This is evidence of one-party rule and one sided thinking at NPR that leads to enforced ideology, speech and writing. It leads to people, especially journalists, being sent to the gulag for raising the wrong questions and displaying independence of thought." NPR CEO Vivian Schiller told the network's David Folkenflik earlier today, though, that "our reporters, our hosts and our news analysts should not be injecting their own views about a controversial issue as part of their story. They should be reporting the story." Meanwhile, the Tribune bureau in Washington writes that Williams has signed "a new three-year contract for nearly $2 million" with Fox News. If you're just catching up to this story, scroll down and "read up" if you prefer to see things chronologically. Later, when Fox News' O'Reilly Factor goes on the air at 8 p.m. ET (Williams will be a guest), we'll be back to update The Two-Way with what's said. Update, at 2:20 p.m. ET: NPR CEO Vivian Schiller says Williams should have kept his views about Muslims to himself, "his psychiatrist or his publicist." Since we first put this post up at 8:38 a.m. 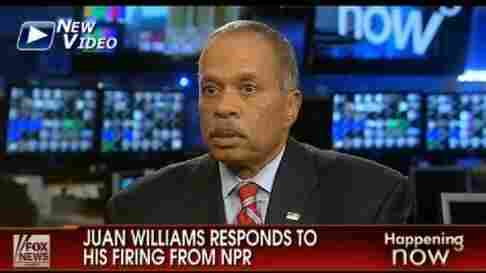 ET, the story of the termination of news analyst Juan Williams' contract with NPR over remarks he made on Fox News Channel about Muslims has only gotten hotter. Williams was on Fox this morning and defended what he said earlier this week on The O'Reilly Factor -- that he gets "nervous" if he's at an airport and sees "people who are in Muslim garb." "It's not a bigoted statement," Williams said today on Fox. "I said what I meant to say, that it's an honest experience. ... I have a moment of anxiety, of fear, given what happened on 9/11." The Fox video from earlier today is here. -- It's "total censorship," former House Speaker Newt Gingrich, R-GA, said on Fox News this morning. He called on Congress to investigate. -- Former Arkansas Gov. Mike Huckabee, who now hosts a show on Fox, issued a statement saying "I will no longer accept interview requests from NPR as long as they are going to practice a form of censorship, and since NPR is funded with public funds, it IS a form of censorship. It is time for the taxpayers to start making cuts to federal spending, and I encourage the new Congress to start with NPR." For the record, here's a link to charts that break down where NPR and its member stations get their money. -- Former Alaska governor, 2008 Republican vice presidential nominee and Fox News contributor Sarah Palin tweeted that "NPR defends 1st Amendment Right, but will fire u if u exercise it. Juan Williams: u got taste of Left's hypocrisy,they screwed up firing you." -- As for the liberal side, Earl Ofari Hutchinson writes at The Huffington Postthat if NPR "had the ounce of integrity and fairness that it incessantly brags about (it) should have dumped Williams a long time ago for his equally great offense. And that's his two decade con job as a liberal, civil rights expert and even supporter." Fox News' Bill O'Reilly (it was on his show where Williams made the comment about Muslims), just said on the air that Juan will be back on The O'Reilly Factor tonight. "NPR News has terminated the contract of longtime news analyst Juan Williams after remarks he made on the Fox News Channel about Muslims," the network's David Folkenflik writes this morning. It's some of the hotter news on the Web right now. "O'Reilly has been looking for support for his own remarks on a recent episode of ABC's The View in which he directly blamed Muslims for the Sept. 11, 2001, attacks. Co-hosts Joy Behar and Whoopi Goldberg walked off the set in the middle of his appearance. "Williams also warned O'Reilly against blaming all Muslims for 'extremists,' saying Christians shouldn't be blamed for Oklahoma City bomber Timothy McVeigh." Conservative bloggers and commentators, such as Michelle Malkin, are weighing in. She says NPR "caved into left-wing attack dogs." From the left, Salon's Glenn Greenwald sees what Juan said as "anti-Muslim bigotry." NPR Ombudsman Alicia Shepard has previously blogged about "Juan Williams, NPR and Fox News" and that he has been a "lightning rod" for things he's said while providing commentary on Fox. We won't be surprised if Alicia writes about Juan's termination in coming days. You can send comments to her here. Juan told David late last night that he isn't ready yet to talk about what's happened.